Expanding clicks-to-bricks retailer Loaf made further top line gains as it began its rollout of showrooms across the UK. Profits fell on narrower margins, investment costs and foreign exchange. Cash runway shortens in past four months, as mattress brand reimagines its business and taps investors for more money. Eve Sleep will lower its investment in marketing and try and generate more repeat business, its new CEO said yesterday. The direct-to-consumer business also plans to raise £15 million in equity funding before the end of the year. Yorkshire mattress start up Sid, an acronym of sleep intelligent design, is today (Nov. 16, 2018) opening its first store, with a pop-up shop at Victoria Leeds. TCM Corp acquired Alexander & James owner DM Midlands in 2016, having bought Alstons the year before. 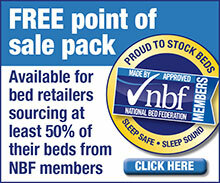 Its Q3 figures include all its UK sofa businesses combined. The Thai owner of sofa makers Alstons and Ashley Manor has reported lower third quarter sales for its combined UK sofa business unit but wider margins, leading to improved profits. House of Fraser is to close its stores at Norwich, Nottingham, Newcastle's Metro Centre and Lakeside Shopping Centre at Thurrock in early 2019 after rent talks with the property owned failed to yield an agreement. IP lawyers representing Furniture Village will make the case for an online retailer's application to trademark the phrase HomeFurnitureLand to be quashed at a hearing next month. Privately-owned furniture wholesaler Annaghmore Agencies improved cash generation in a challenging year that saw sales lift but earnings fall on narrower margins. Negative year-on-year home sales returned for John Lewis & Partners in a tough overall week that saw total sales across the chain drop by just over £8 million. Early export wins, dining ranges and higher sales with existing customers were behind Baker Furniture's top line growth in 2017–18, according to managing director Mark Callaghan. Far East upholstery giant Man Wah Holdings says its summer acquisition of one of Vietnam's largest furniture manufacturers shields the business from the impact of tariffs. N Brown, the home shopping retailer, says it faces higher marketing costs and a potential asset write-down as a result of a "mixed" draft verdict in its long-running legal battle with the tax man regarding VAT. Privately-owned furniture retailer Barker and Stonehouse grew sales double-digit in 2017–18 with the impact of new stores and online combining to deliver a sixth straight top line gain. Year-on-year mattress imports advanced for the fourth straight month in September with a 9.9 percent increase driven by the two largest supply nations. Belgian carpet makers posted their weakest year-on-year export comp for the UK market since last November at the end of the third quarter of 2018, losing share to their Dutch rivals. Sales advanced again for fitted furniture maker and retailer Ashley Ann in the year to end March but the privately-owned company cautioned it was not expecting to grow at the same level in 2018–19. Independent department store group Ulster Stores built on a return to growth in 2016–17 with rising sales and profits in the year to January 31, 2018. An Atlanta headquartered investment giant has built more than a fifth share in Victoria, the acquisitive floorcoverings giant, after a series of transactions over the past year. The turnaround in Italian sofa imports gathered pace in September with the value of goods from the country rising by a third, countering weak figures from elsewhere including China. Britain's three biggest overseas sources of living, dining and bedroom cabinet all exported less to the UK in September with the total for the combined categories slipping 5.0 percent. Regional floorcoverings retailer and wholesaler Calverts Carpets booked higher profits in 2017–18 as its lower cost-of-sales helped counter the impact of a top line decline. General merchandise giant Argos, one of Britain's largest retailers of furniture, will have 280 stores inside Sainsbury's supermarkets by the end of its 2018–19 financial year with another 30 units planned over the next six months. Bedding company Trendsetter Home Furnishings says it has addressed a number of challenges to reverse the impact of "an exceptionally difficult year" during which it booked a seven-figure net loss. The CEO of Tempur Sealy International — the world's biggest bedding company — says he believes Chinese imports may be hitting bed-in-a-box companies harder than other mattress segments, harming their growth potential. The CEO of Maisons du Monde says she is not concerned regarding potential store closures at UK department store chain Debenhams, where it has opened instore studios this year. At least four bed makers — all registered to the same Birmingham address — have entered insolvency proceedings in the past six years. Investment brought instant payback for South East furniture and department store retailer Collingwood Batchellor with rising sales and profits ahead of a warehouse refurbishment project that finished this summer. The Hong Kong investment company that bought into British discount department store chain TJ Hughes last year has increased its stake in the company. Victoria, the acquisitive flooring supply group, has walked back refinancing plans announced last week with chairman Geoff Wilding criticising onlookers whose "motives are less than pure." Furniture retailer The Cotswold Company is continuing to build out its bricks and mortar presence, stretching its footprint north and south with a Yorkshire unit to follow its just-opened Surrey showroom. Home sales climbed for John Lewis & Partners last week as the department store mutual booked its highest total sales figure for 2018 so far, passing £100 million for the first time this year. Half-year profits at Marks and Spencer Group (M&S) advanced 6.1 percent with the food and general merchandise retailer continuing to transition more of its business from bricks to clicks. Ena Shaw, the diversified North West soft furnishings business, says it has made significant progress turning its Montgomery unit around with restructuring work to complete by the end of 2018. John Lewis of Hungerford, the upscale fitted furniture maker and retailer, says the success of its push into the bedroom category opens the door to the division developing a 'whole home' offer. Casper, the U.S headquartered bed-in-a-box company, provided more funds to expand its British and mainland European operations in 2017, new accounts suggest. Dunelm's multi-million pound investment in the historic Fogarty brand is secure despite the collapse of the legacy Lincolnshire manufacturer that produced filled bedding under the label for the national retail chain. Follows agreement with rival department store chain. Upscale Swedish bed maker Hästens opens its new Notting Hill showroom today (Nov. 6), the first of three new UK standalone stores opening by the end of the year. Discount flooring chain Carpets 4 Less maintained network sales in the year to January 31, 2018, arresting a double-digit prior year slide. Silentnight, the UK's largest bed manufacturer, is free of shareholder debt after paying down the last of its outstanding loans to an affiliate of HIG Capital, its longtime private equity owner. Wider margins helped boost profits at Silentnight in 2017–18 after Britain's biggest beds manufacturer adjusted its range to eliminate loss-making products. The move also impacted sales. Profits fell at expanding home and leisure retailer The Range with the circa 150-store chain blaming the decline on the weakness of the pound against the dollar. New stores helped sales to climb. Europe's biggest mattress producers will not stand by and watch if soon-to-be-imposed tariffs result in Chinese made products being diverted away from the U.S, according to the head of the leading pan-continental beds trade body. IKEA, the world's largest home furnishings retailer, says it grew UK sales in the year to August 31 driven by double-digit growth in its ecommerce business and new stores.